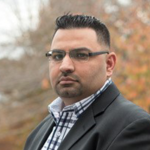 Hello, my name is Amit Lall (AJ) and I’m a passionate Realtor® and Community Leader on a mission to help make my clients’ dreams of home ownership a reality. Both personable and professional in my approach, I ensure the entire home-buying or selling process is as seamless and pleasant as possible from start to finish. And as a longtime resident of Virginia, I’m well-versed in the local marketplace, representing both sellers and buyers throughout the Greater Washington area. When it comes to my sellers, I harness the power of the most cutting-edge technology and marketing tactics to make sure your property is seen by the most relevant prospects. From professional photos and videos to featuring your house on 1,000+ high-traffic websites, your property will inevitably be sold for top dollar. However, what I’m the most known for is my knack for assertive negotiation, relentless salesmanship, and top-notch customer service. To me, being a Real Estate Agent has been more than a profession, it’s a passion and purpose. I’m always grateful for the opportunity to guide someone through the largest investment they will make in a lifetime. If you’re a first-timer, an experienced seller, or anything in between, I’m here for you everything step of the way, so don’t hesitate to contact me with any inquiries.